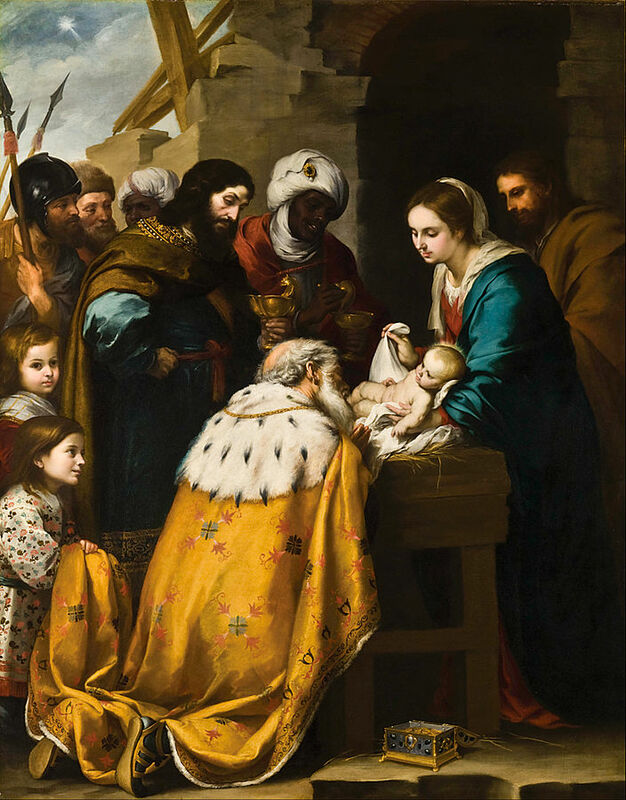 Adoration of the Magi (1655 – 1660). Artist: Bartolomé Esteban Murillo. Source: Wikimedia Commons. This time of year, most planetariums (including ours) are offering shows explaining what the Christmas Star might actually have been. Of course, to have this conversation we must make two assumptions, each of which many dispute: 1) the star was a true historical event and 2) it has a natural scientific explanation and is not simply a miraculous act. To find an astronomical event that might have inspired the Magi to search for a newborn king, we must bear a few things in mind. First, our year, currently 2017, is numbered from the year in which the monk Dionysius Exiguus, in the year 525, estimated that Jesus might have been born. For Dionysius, that year was year 1, and the year before 1 BC, as Europeans were not yet using zero in calculations. There is some indication, though, the Dionysius was a bit off fixing the year of Jesus’ birth. The Gospels refer to king Herod of Judea decreeing the death of all newborn infants in the wake of Jesus’ birth. However, Herod, who ruled Judea as a client of the Roman Empire, was a real historical figure who died in 4 BC. If indeed he reacted in anyway to Jesus’ birth, that birth must have happened a few years earlier than Dionysius thought. 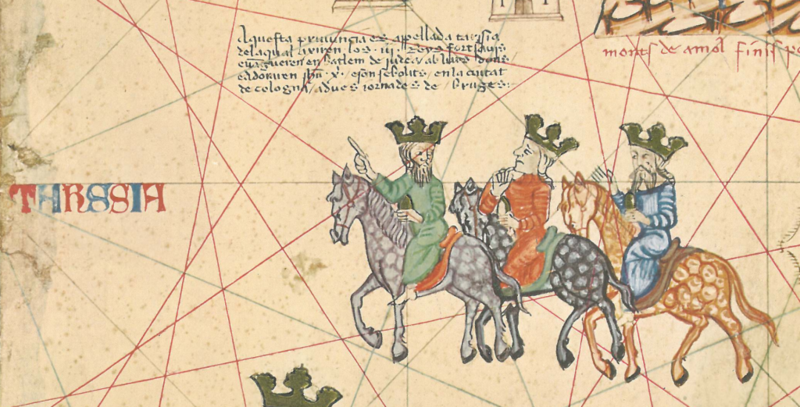 The Three Wise Kings, Catalan Atlas, 1375, fol. V: “This province is called Tarshish, from which came the Three Wise Kings, and they came to Bethlehem in Judaea with their gifts and worshipped Jesus Christ, and they are entombed in the city of Cologne two days journey from Bruges.” Source: Wikimedia Commons. Secondly, the Wise Men following the star were probably astrologers. Our modern science of astronomy arose quite recently; real observations of the planets and stars began with Galileo’s telescope in 1609. 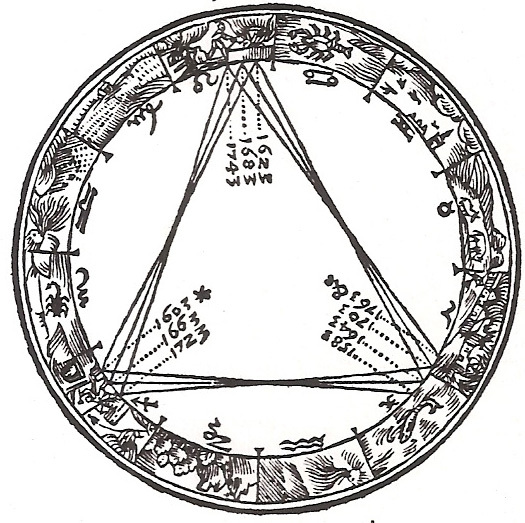 Much more prevalent in antiquity was astrology–looking to the heavens for omens to predict the future. Babylonians, in particular, practiced much astrology. Indeed, I wrote a blog about six years ago explaining how our current zodiac began in Babylon. Babylon is indeed east of the Holy Land; many have guessed that if there were indeed Wise Men, they would have come from there. Despite the ‘astro’ prefix, astrologers focus not on stars but on the sun, moon, and planets. The only stars of note are those that can appear near the planets—those in the zodiac. After all, the stars appear in the same patterns for multiple human lifetimes. The motions of sun, moon, and planets against the background stars are a more likely source of ‘omens’ about the future. As it turns out, the motions of Jupiter and Saturn in 7-6 BC might have attracted the attention of local astrologers, including the Magi. Jupiter and Saturn are the most distant planets visible to the unaided eye and therefore move the slowest against the background stars. (Jupiter takes 12 years to reappear near the same stars; Saturn takes 29.5). The two planets align in our sky and thus are in conjunction, only once every 20 years or so. If the conjunction occurs when Earth is on the same side of the Sun as Jupiter and Saturn, we can see a triple conjunction, which is three Jupiter/Saturn conjunctions in a year. In such a scenario Jupiter would overtake Saturn, creating the first conjunction. But then Earth, on its much faster orbit, would quickly overtake them both, and both giants would seem to reverse their motion in our sky. This would result in a second conjunction, with Jupiter and Saturn moving ‘backwards’. Once Earth left the pair far enough behind, we would see them resume ‘normal’ motion against the background stars, causing a third conjunction. A series of ‘great cojunctions’ (conjuctions of Jupiter and Saturn), an illustration from Kepler’s book ‘De Stella Nova’ (1606). Source: Wikimedia Commons. This is precisely what happened in 7-6 BC. Jupiter and Saturn appeared in the east at dawn in April of 7 BC, with conjunction #1 following in late May. In late summer, Earth overtook the pair, causing both planets to shift ‘backwards’ against the background stars. The second conjunction, with Jupiter and Saturn moving retrograde (or ‘backwards’) followed in September. Then, as Earth pulled ahead of both planets on its much faster orbit, they both went back to moving ‘forward against the background stars. The third conjunction occurred in early December 7 BC. In early 6 BC, a third planet, Mars, began to approach Jupiter and Saturn. As Mars overtook Saturn in late February and then Jupiter in early March, the Magi (and anyone else) could have watched three planets set together in the west right after sunset. Throughout this entire sequence, Jupiter would never be more than a few degrees away from Saturn. What’s more, the whole time both planets appeared against the stars of Pisces, the Fish. In the astrology of the Magi, Pisces represented the house of the Jews. Of course, there is now way to be sure that this is what the Magi followed. As usual when only one literary source describes an event, there is no hard data to confirm if it is real, much less any details about it. If you choose to believe that the star is simply a miraculous event which admits no scientific explanation, I can’t refute that either. However, the conjunctions did occur and would have peaked astrologers’ interest. Jupiter and Saturn would have slowly shifted from east to west in the sky over the multiple months it would have taken to travel from Babylon to the Holy Land, seemingly guiding them. And these conjunctions occurred in Herod’s lifetime, matching the gospel description. The next time we’ll see Jupiter align with Saturn is in December 2020. I’m not an astrologer, so I can’t fortell any miraculous or royal births for that year.